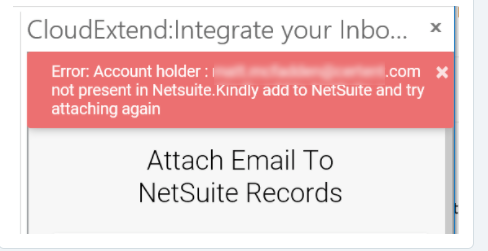 Resolving Error: Account holder (your email) not present in NetSuite. Kindly add to NetSuite and try attaching again. Is CloudExtend not resolving your email address to your employee record? Find out why and fix it right here. Our App is secure and relies on your NetSuite permissions to find the sender and recipient records in NetSuite. In some scenarios (unique to your NetSuite roles) your employee record may not be visible via search. In this scenario it does exist in NetSuite but our App advises it cannot be found. This is because your NetSuite role does not have view access to employee records so they won't appear in the search results. There are two ways to solve this at the present time (we are working on an automated solution). If the solutions below do not work for you please check with your NetSuite Admin and ensure that you have permission to view Contact records.